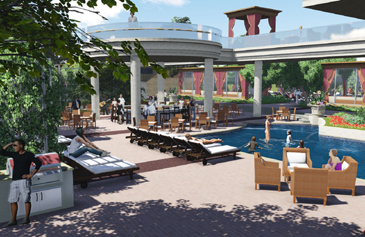 Lifescapes International will create the landscape design for the main resort-style pool, complete with an outdoor bar, private cabanas, and landscaping that increases the dramatic element of being in the setting. Incheon, South Korea — Lifescapes International, a Newport Beach-based landscape architectural firm, has been selected as the landscape architect for Paradise City, an integrated entertainment and gaming resort in Incheon, South Korea, which is planned to span 83 acres. Lifescapes International will design a large Las Vegas-style main entry, the exterior perimeter of the resort, a resort-style pool, poolside bars, wedding gardens, private villas, and gardens that will flow throughout the project. According to Julie Brinkerhoff-Jacobs, President of Lifescapes International, the firm was selected as the landscape architect for this project based on its tremendous depth of experience working with integrated entertainment and gaming resorts, including 12 of the most notable destination resorts on the Las Vegas Strip, such as the Wynn Las Vegas, the Bellagio, Paris Hotel & Resort, The Palazzo, Treasure Island, the Mirage, and the Venetian, among many others. Paradise City, which broke ground in late November 2014, is planned to open in 2017. As part of its work on the perimeter of the resort, Lifescapes International will design large water features, among many other elements. The firm will also create the landscape design for the main resort-style pool, complete with an outdoor bar, private cabanas, and landscaping that increases the dramatic element of being in the setting. Lifescapes International will also highlight South Korea’s rich culture by integrating many local and native plants to South Korea, including Korean Fir, Abies Koreana, Korean Bellflower, Campanula Takesimana, Carpinus Coreana, and Korean Hornbeam, along with many deciduous flowering trees and conifers. In addition, Lifescapes International will integrate a series of native trees including Pinus Densiflora, Taxus Cuspidate, Acer Palmatum Thunb, Celtis Sinensis, Pinus Strobus, and Ulmus Davidiana Var. Japonica, among several others. “One of the major inspirations behind this resort is ‘hallyu,’ which is current South Korean pop culture,” notes Amador. Paradise City will be located in the International Business Center of Incheon International Airport. Paradise City will include a five-star hotel, a boutique hotel, a casino, a convention center, a hallyu-themed plaza, an indoor theme park, retail shops, restaurants, and a luxury spa, among many other amenities. The large resort complex is being developed as a joint venture between Korea’s casino operator, Paradise Group, and Japan’s entertainment group, Sega Sammy Holdings, Inc. Chun Phil-lip is the Chairman of Paradise Group, and Jung Yeon-Soo is the CEO of Paradise Sega Sammy. A team of international and domestic designers and engineers have been brought in to design the project. Lifescapes International has spearheaded many iconic landscapes that have been recognized as trendsetters in the industry, including resorts and hotels, casinos, residential communities and retail/lifestyle centers. Notable projects include The Mirage; The Bellagio; Wynn Las Vegas; Red Rock Resort & Spa; The Venetian; Fontainebleau Miami Beach; the West Zhujiajian in China; the Hyatt Regency Thessaloniki in Greece; the Venetian Hotel and Resort and the Four Seasons Macau; among many others. Additional information is available at www.lifescapesintl.com.